What a surprising winter we’re having here in Western Washington! If there’s anything you should know, it’s that every type of weather has a profound effect on the farm. Though we normally have quite mild winters, we’ve recently been doused with enough snow to cause some challenges, however beautiful it may be. Today I’m sharing some glimpses from around the farm during these winter days. To say that the farm has been transformed into a magical winter wonderland would be an understatement. The stillness and quiet of falling snow and the blank slate it creates are overwhelmingly serene. We like to leave our last planting of flowers to go to seed out in the field as a food source for the birds through the winter. Above are the airy branches of one of our favorites, Rudbeckia triloba. 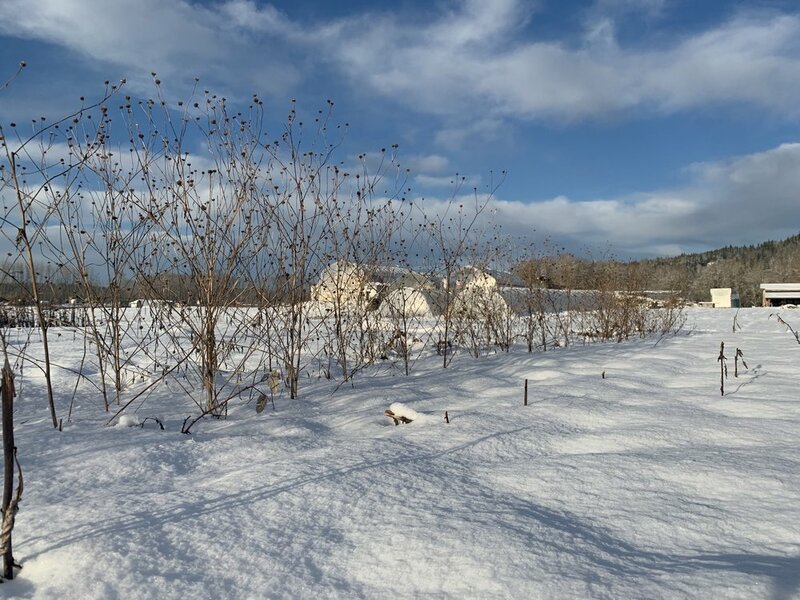 Beneath the surface of the snow, this perennial, like others on the farm, has stored up its potential and will start to grow again once the weather begins to warm. It’s easy to spot the tracks of our resident coyotes, deer, and rabbits criss-crossing the landscape. The eagles stood watch over the lake and fields looking to catch a meal. Even the beavers and otters were out, coming up out of the lake through holes in the ice to play on the frozen surface. What they say about dogs loving the snow is really true! Stevie has been having the time of her life prancing, bounding, and rolling in the snow for hours on end! The winter weather hasn’t been all fun and games. Snow, especially the wet and heavy kind we’re known to get, accumulates on greenhouses as it falls. With a heavy enough snowfall, the weight of the snow can cause the structure to collapse. With that in mind, I decided to head home early from a birthday trip just in time for nearly 5 back-to-back nights of snow. Each evening and each morning we cleared everything that had accumulated from the greenhouses. Lucky for us, all of our structures stayed standing through the “snopocalypse.” We’re thinking of many of our friends and neighbors who were not so fortunate and suffered big losses and heavier snows. Please remember to keep supporting your local farmers all year long! Though the ground is still covered with a layer of snow, we’re busy sowing the first of our seeds on warm tables in our seed starting greenhouse. Inside the caterpillar tunnels our earliest blooming flowers are cozy, and slowly growing to put on a gorgeous spring display. We’re hopeful the snow will melt and our chance to get into the fields this spring will come on time. As the massive amounts of snow in the mountains, foothills, and valley begins to melt as days warm, we are truly hoping we won’t be hit with major flooding. 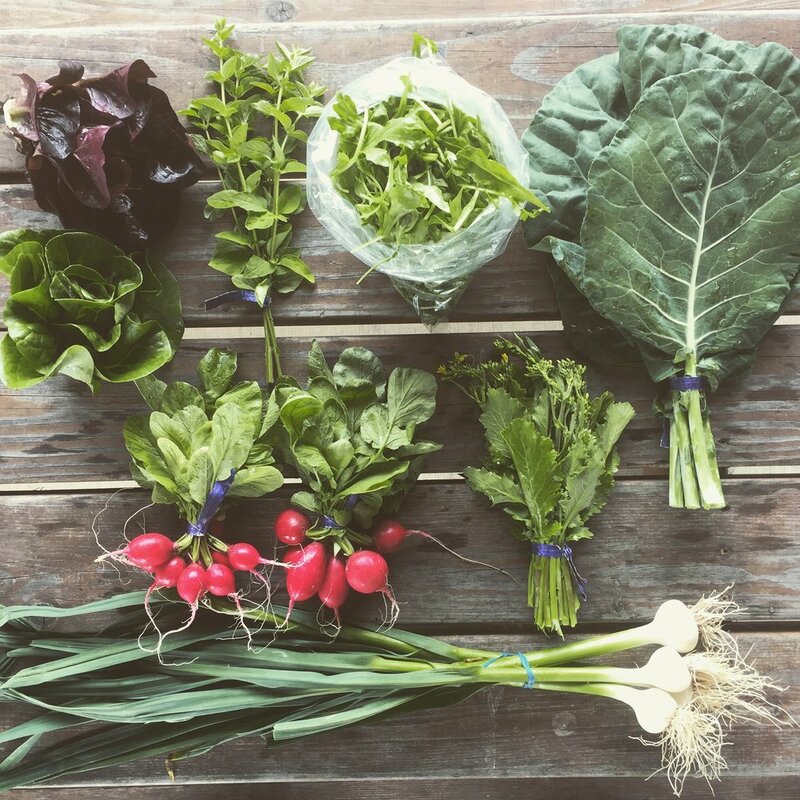 For now, we keep planting, planning, crossing our fingers, and dreaming of the season ahead.